Would you believe that this is the first time I have turned on my lap top in over a week? I know I can’t! I’m one of those people that is a compulsive email, facebook, and general internet checker. Even if I don’t have time to respond to or interact with what I read, I still constantly check. I guess smart phones and laptops will do that to you. Last Thursday I hopped on a plane to head home for the holidays; while I was on the plane I watched 5 episodes of Modern Family and watched my battery go from 100% to 2%. Once I landed it was go, go, go right from the start. I never even had time to recharge the battery, literally and figuratively. Unfortunately that means this poor little blog of mine was seriously neglected! While I haven’t had time to make anything new this week, I do have a few aces in my back pocket, including these Chicken Pesto Lasagna Roll-Ups. I wouldn’t exactly call this a fast weeknight dinner, but it can certainly be made easier by using store-bought sauce and pesto. Homemade is nice (and often better) but it’s all about doing what you can with the time you have. In a saucepan over medium heat, melt 1 tablespoon of butter. Add flour and whisk until smooth, about 1 minute. Stream in milk, whisking constantly. Add salt and pepper and cook until thickened, about 3-4 minutes. Add 1/4 cup of the white sauce to the bottom of an 8×8 pan. In a medium size mixing bowl, stir together the chicken, ricotta, pesto 1/4 cup of mozzarella, salt and pepper, until combined. Spread ~1/3 cup of the ricotta mixture over each lasagna noodle. Roll up the noodles and place seam side down in the 8×8 pan. 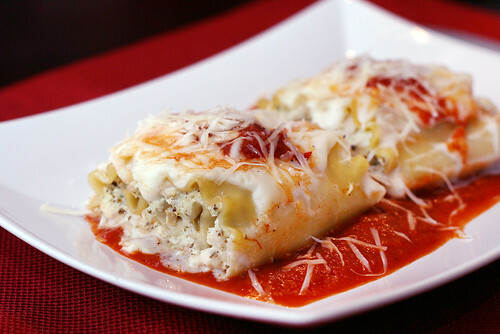 Top the lasagna rolls with the rest of the white sauce, a spoonful of red sauce and the rest of the mozzarella cheese. Bake for 25-30 minutes, or until the cheese is bubbly. Serve on a bed of red sauce with Parmesan cheese for garnish. Some of the things I missed the most while I was in China were cheese, bread, and dessert. I got my fill of good vegetables, meat, and seafood, but nothing quite filled the hole in my heart (or stomach, in this case) that cheese and carbs left. So it shouldn’t surprise anyone that my first meals back were loaded. Driving back from the airport we even made an emergency pit stop at In-N-Out Burger. Double double mustard fried with grilled onions and a Neapolitan shake? Yes please! Next up on my must-have-soon list was an over the top cheesy pasta dish, and lasagna fit the bill perfectly. 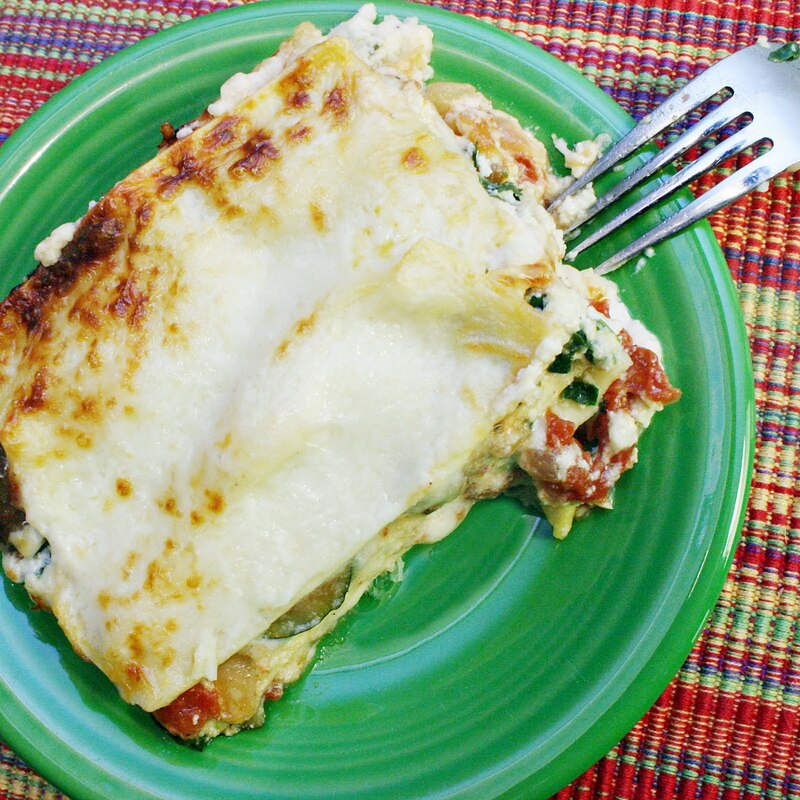 I’ve posted a vegetable lasagna recipe already, but this craving was for the classic version. So I whipped up a classic lasagna and enjoyed every last bite of the delicious cheesy, carb loaded, meat filled goodness. Then, yesterday I read online that July 29th is National Lasagna Day. Perfect! I bumped this recipe up the line so you’ll be prepared to make your own for the special day. In a large skillet, brown and crumble the Italian sausage. When the sausage is cooked through and browned add the tomato paste and garlic. Cook for 30 seconds or until garlic is fragrant. Stir to coat the sausage with the tomato paste. Season with dry basil, oregano, parsley, rosemary, salt, pepper, and red pepper flakes and cook for 1 more minute. Stir in the diced tomatoes and tomato sauce and bring to a simmer. Add the red wine and continue to simmer for 10 minutes. While the meat sauce is simmering, combine the ingredients for the ricotta filling in a medium sized bowl. After the 3rd group of layers, top off the lasagna with another layer of noodles, the last of the sauce, and the rest of the shredded cheese. 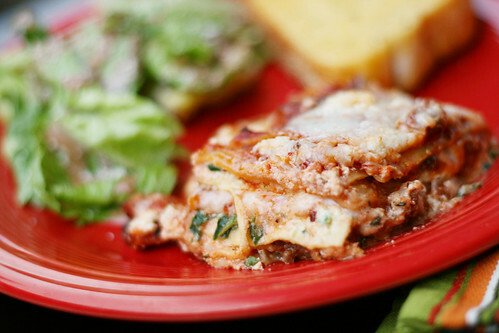 I Love Lasagna and Happy Mother’s Day! This meal is in honor of Mother’s Day! Last summer my mom and I took a vacation to Disneyworld. It was the first time either of us had ever been and it was so much fun! We stayed at the Movie All-Stars resort and we were able to go to Epcot, Magical Kingdom, and Hollywood Studios. Truly an amazing trip and it was so great to get to hang out just my mom and I. One night we made dinner reservations for Tony’s Town Square in the Magic Kingdom. We both ordered the vegetable lasagna and it was actually pretty darn good. Of course the portion sizes were huge so we wound up wishing we just would have shared (but then I wouldn’t have been able to eat ALL of the cheesy top so maybe it was better that way). 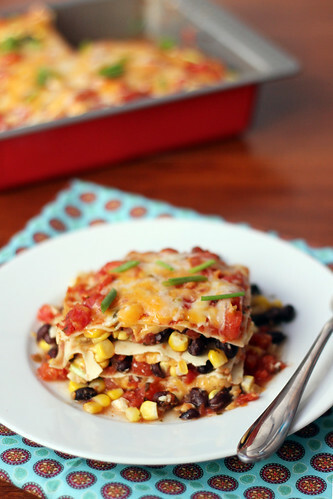 Since that time I have had vegetable lasagna on my to-try list. Part of the trouble with lasagna is that it makes a ton. It was just me eating the lasagna last night so I didn’t want to make a 9×13 pan. I initially planned on using a small Le Crueset baker that I have but after pulling it out I thought the sides weren’t tall enough. I wanted to have lots of room for cheesy goodness in my lasagna. I looked around the rest of my bakeware and finally I decided that my 9×5 bread pan was best suited for the small lasagna job. It worked out perfectly! 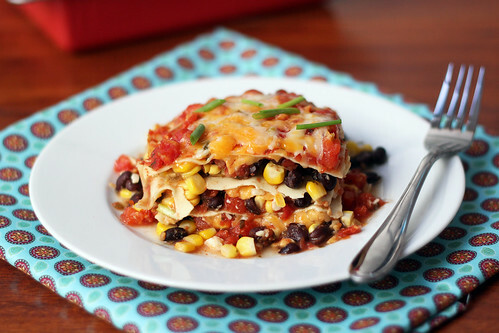 I think as is this recipe would serve 3 people perfectly, or in my case dinner and leftovers for 2 lunches. This lasagna was DELICIOUS! 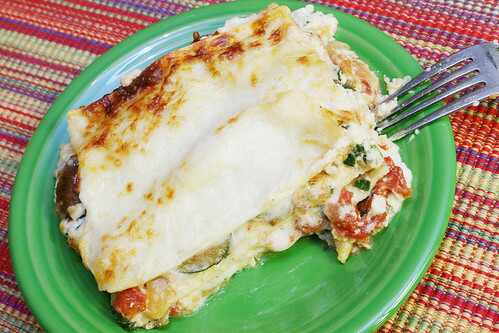 The bechamel sauce added a rich flavor that went so well with the tangy tomatoes. I used zucchini, yellow squash, tomatoes, onion, mushrooms, and spinach, but this recipe is so adaptable you could really use any of your favorite vegetables. Eggplant and bell peppers would make an excellent addition. Play around and see what combination you like best! In a large skillet, over medium heat, heat the olive oil. Add the zucchini, squash, onion, mushrooms and garlic. Cook for 2 minutes or until the onions start to turn translucent. Add the seasonings and can of whole tomatoes. Use a wooden spoon to break apart the whole tomatoes. Reduce heat to medium-low and let simmer while you make the bechamel sauce. In a small saucepan, over medium-low heat, melt the butter. While the butter is melting heat the milk in the microwave for 1 minute and 30 seconds. When the butter is melted, slowly add the flour whisking constantly. After 4 minutes, when the butter is a light golden color, slowly add the hot milk whisking constantly. Increase the heat to medium and bring the mixture to a boil, whisking often. Cook for 10 minutes then remove from the heat and add the salt and nutmeg. (during this time I made the ricotta mixture, remembering to whisk often) Then remove from heat and set aside until ready to assemble the lasagna. In a small bowl combine the ricotta, Italian cheese, spinach, egg, basil, salt and pepper. After the 3rd group of layers, top off the lasagna with another noodle, the last of the Bechamel sauce and the last 1/3 cup of shredded cheese.